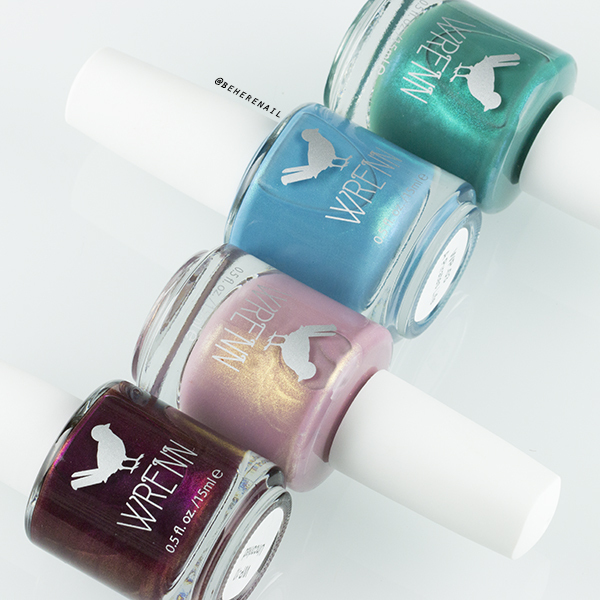 All three of these polishes perform excellently as stampers and one coat lacquers. 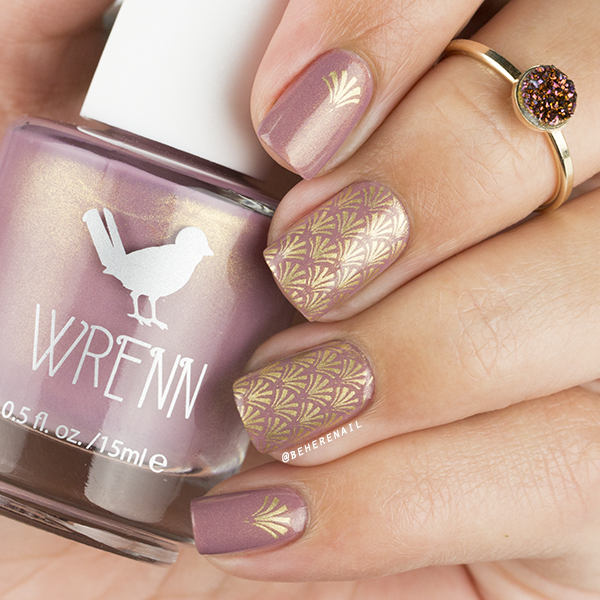 It was really great to have a stamping polish and coordinating accent nail color in one bottle. 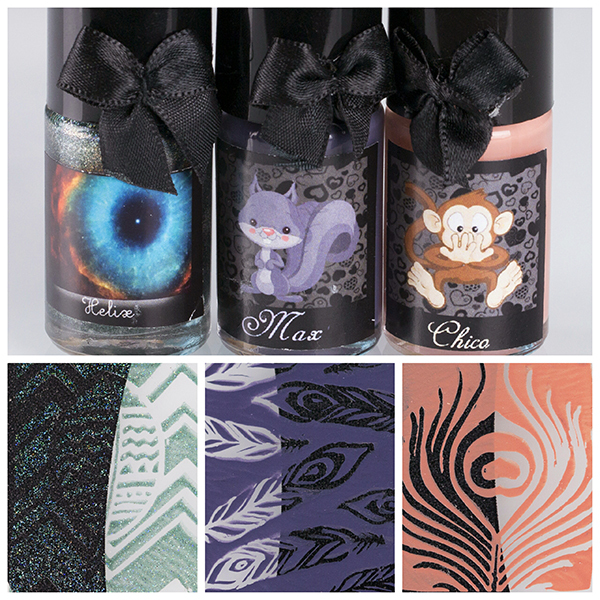 In the front we have Helix from the Nebulas collection, all gorgeous stampable holos; and in the back you have Chico and Max from the Love Animals collection, beautiful and unique cream shades. These bottles are obviously adorable but let me show you how they stamp. These are all first try pick ups with my generic clear stamper on my Bundle Monster Mini Lotus mat. If I am going to have trouble with a stamping polish, especially a shimmer or holo one, it's going to be with my clear stamper so I am seriously impressed with these pick ups. 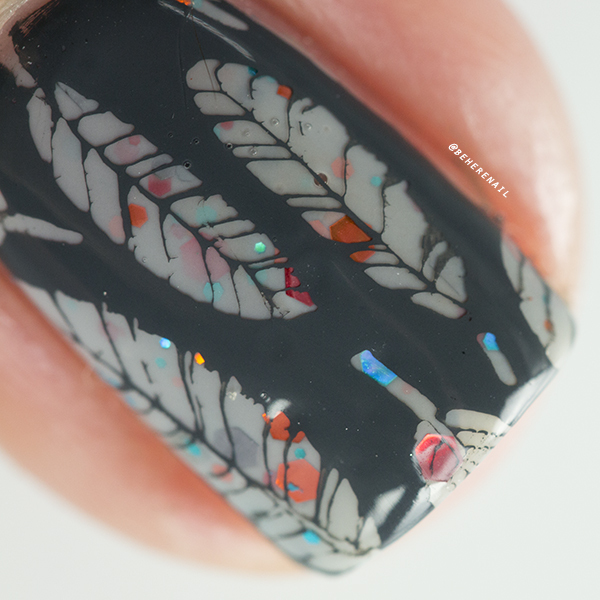 I wanted to use negative space images because I know a lot of stamping polishes have trouble getting full coverage in the large open spaces that they have and again these did a fantastic job, even over black. 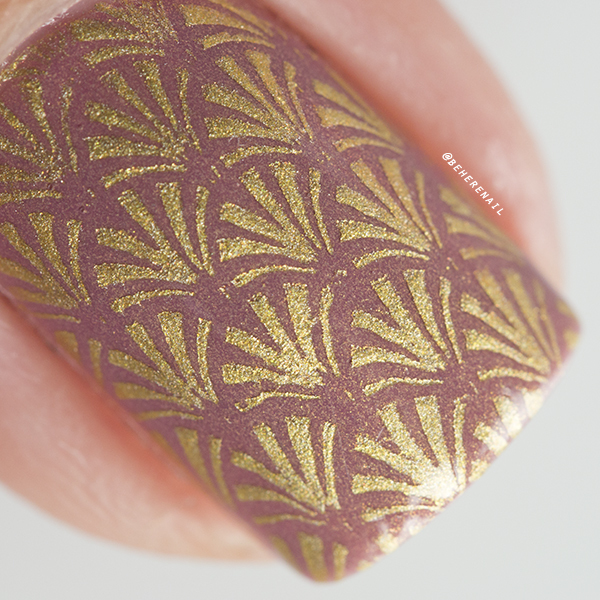 I do think that Helix stamps better over something with some pigment, especially after you topcoat it and it really pops. For the nail art I wanted to keep it consistent and show you in one mani how each polish works as a base polish and as a stamping polish. I also wanted to show you how negative space images performed as well as ones with fine lines. 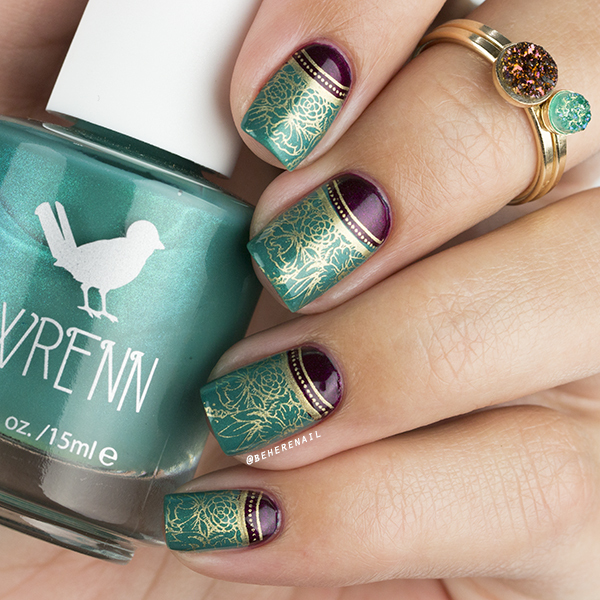 I discovered that MoYou London Tropical 19 had fantastic coordinating feather images perfect for these swatches! 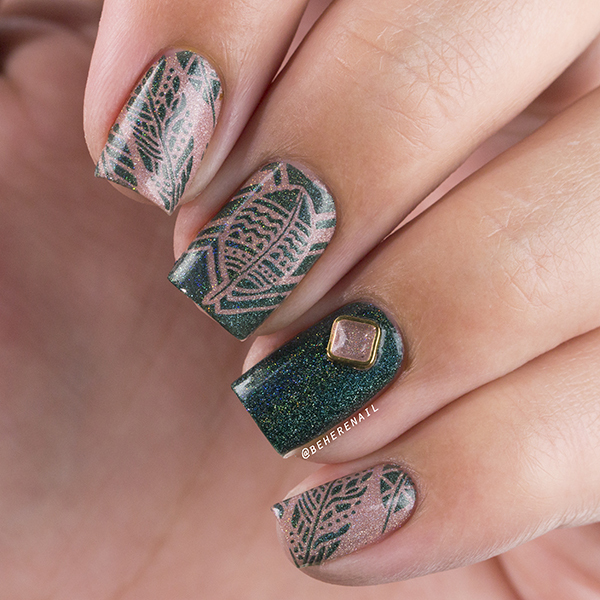 I also made sure that every stamp you see in the following manis was a first try pick up, just to give you an idea of the performance! This is Chico in all his cute little monkey glory! 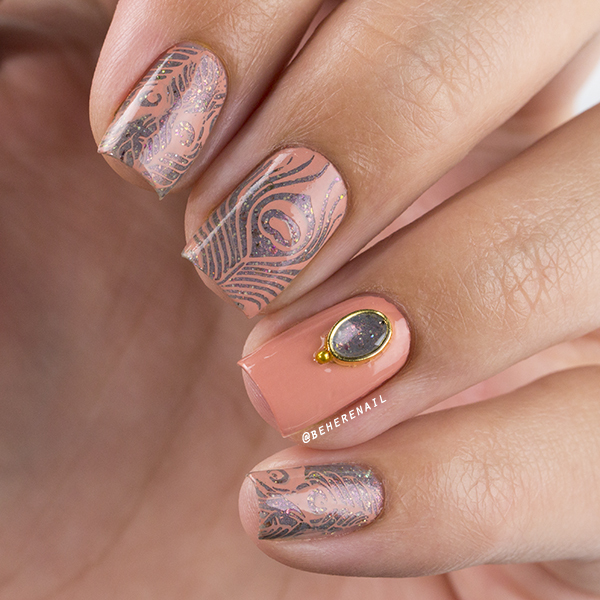 You can see that beautiful one coat cream action as well as perfect crisp fine lines and full coverage negative space stamping. Such a unique shade in between terra cotta and peach. I really gravitate toward shades like this. The beautiful polish underneath it all is Femme Fatale Fairy Duster, the LE color of the month for April 2016, a recent Beautometry purchase. 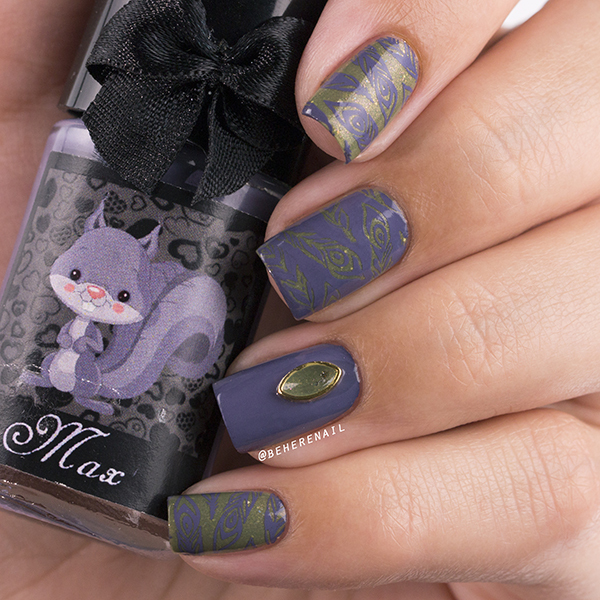 Another perfectly "me" shade is Max, this dusty blue-leaning purple that reminds me of velvet. I had to pair it with another one of my Beautometry purchases, the sadly no longer existent Arcane Lacquer's Abandoned Labor. This olive green is seriously special and I believe there are still a few left if you're anything like me and need all the olives. Again you see nothing but perfect pick ups and one coat cream coverage. So in love! Last but not least is the glorious Helix from the Nebulas collection over Powder Perfect Woodcutter. I seriously feel like I need all of these Nebulas now. 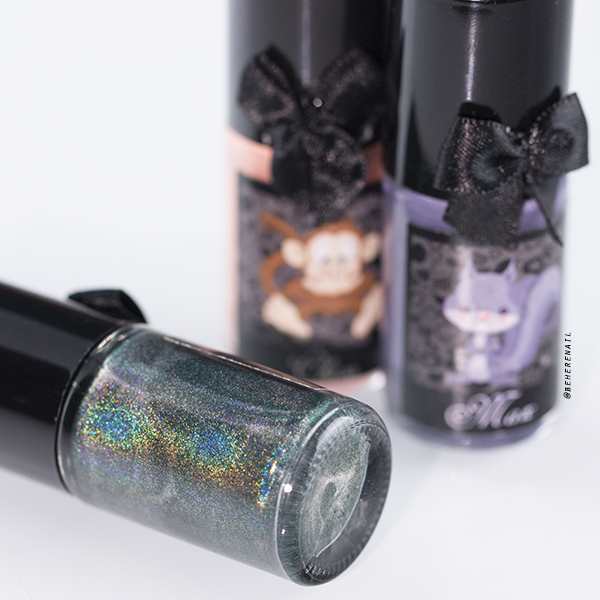 You can see how it really fills in with a little color behind it and that holo is obviously gorgeous. I often have a hard time getting my holos to stamp, even designated stamping polishes, but this was all first try and all so flawless. I feel like Therese got inside my head and sent me the perfect shades to try out as these were all a blast to work with. Definitely make sure to follow Beautometry even if these aren't your cup of tea. They are known to have some of the best sales and I have scored some killer indies at drugstore polish prices. See you guys soon with another review. 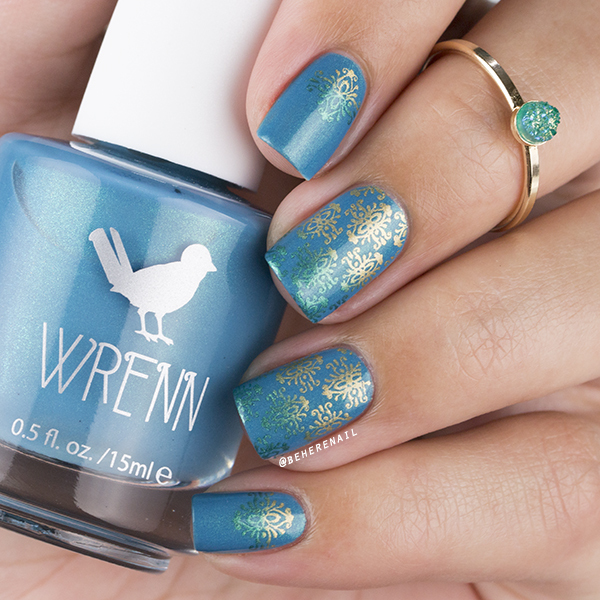 Alissa of @shopwrenn has these gorgeous 5 free and cruelty free polishes inspired by her handmade druzy jewelry and recently she contacted me to review a few of these pretties for you. I was kindly sent four lovely shades and two beautiful stacking rings. From left to right we have Uncorked, Passionfruit Pink, A Pirate's Life and Green with Wrennvy. And we've got some of her gorgeous handmade jewelry, the Abbey Petite Ring in Plum Druzy and the Alexa Tiny Ring in Green Druzy. These little gems remind me of multi chrome nail polish, I know, I have a problem... Jewelry was my original addiction however, and I can't tell you how thrilled I am to add these to my collection. The amount of compliments I received when I wore them out was pretty staggering and you'll see how well they complement the polishes if you just keep scrolling. I have to say the polishes definitely exceeded my expectations. The formula wasn't streaky or brush strokey and none of the colors stained my nails, not even Green with Wrennvy or Uncorked, which really suprised me. 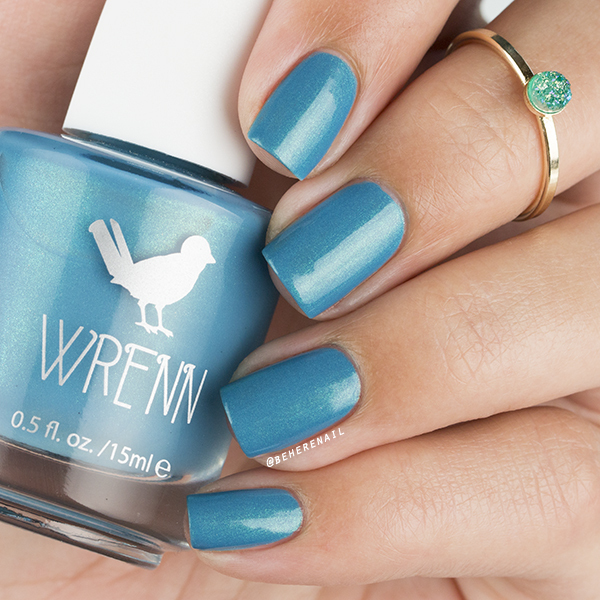 Everything went on in two easy coats, even though Green with Wrennvy had a slightly thinner formula. They all dried quickly with a smooth, glossy finish but I topcoated them anyway because it's what I do! The shimmery finishes are stunning with enough visual interest to hold their own but they also make for some lovely nail art which I will share with you as well. First up is Passionfruit Pink, a dusty rose shade loaded with gold shimmer that played so nicely with my skin tone as I think it would with most. The gold can make it look warm, but the cool tones in the pink make it quite the shifter. It pairs so nicely with the plum druzy that's equally shifty! This next one is called A Pirate's Life. I would describe it as a vibrant turquoise with aqua shimmer. 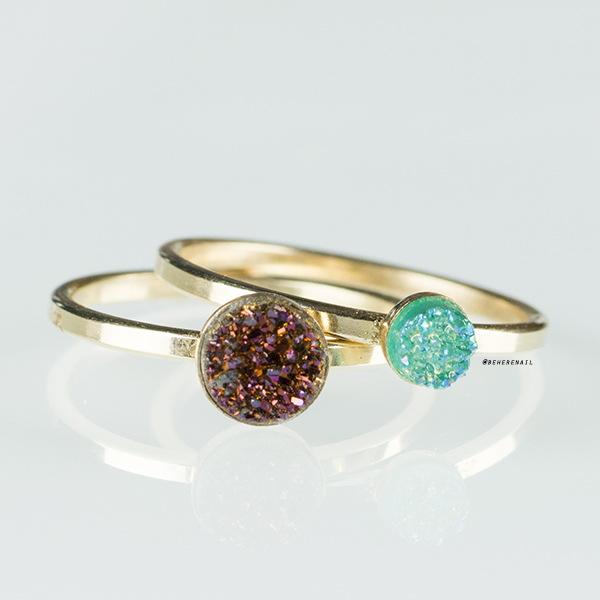 I really love this one too, it just screams summer and plays so nicely with the green druzy ring! 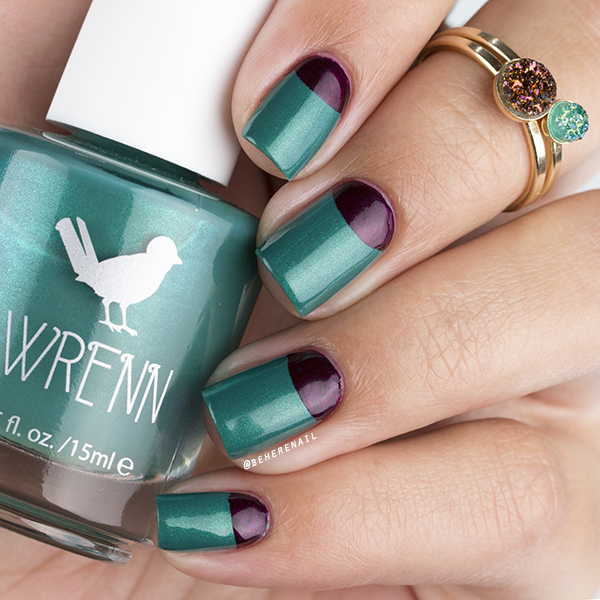 I love my teals so naturally Green with Wrennvy was also a win. 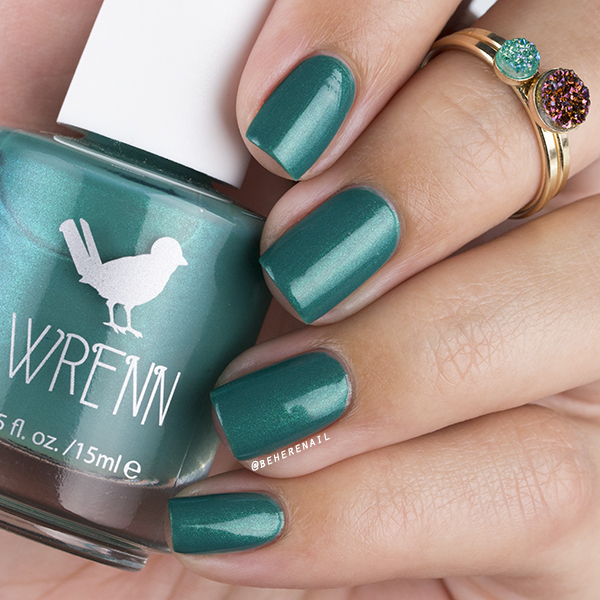 It's a very green leaning, deep teal with a lighter green shimmer. I thought this shade went well with both of the druzy rings, so I stacked them up for these shots! 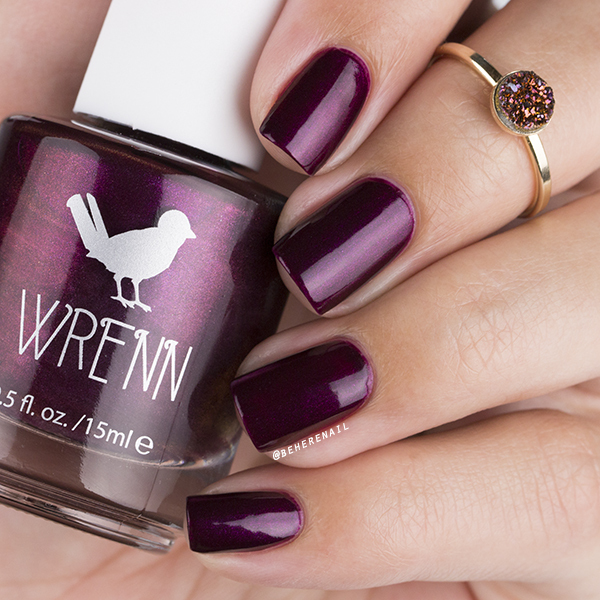 And the last swatch is this beautiful berry wine color fittingly called Uncorked! 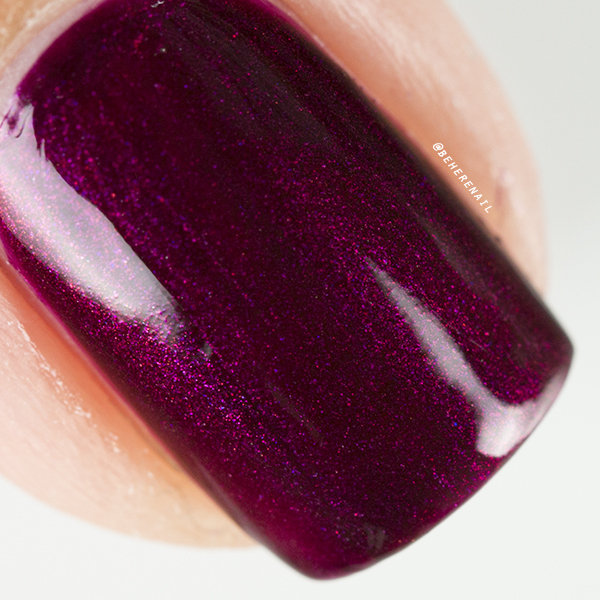 This one was tricky to photograph, but it's a berry colored jelly base with red and purple shimmer. Another shifter that wants to be a deep red and juicy purple at the same time! 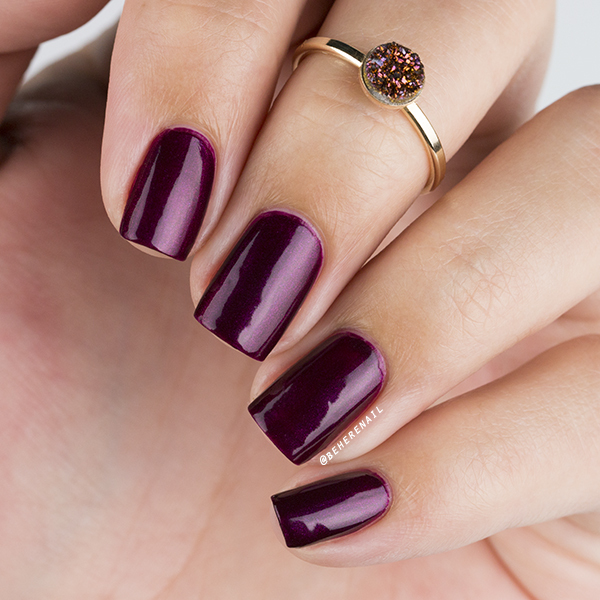 This one was clearly inspired by the plum druzy ring. I was pretty excited to review these polishes, but you know me, I had to get my nail art on with them. Each shade having its own unique shimmer gave me plenty of inspiration, and who doesn't love berry and teal together? 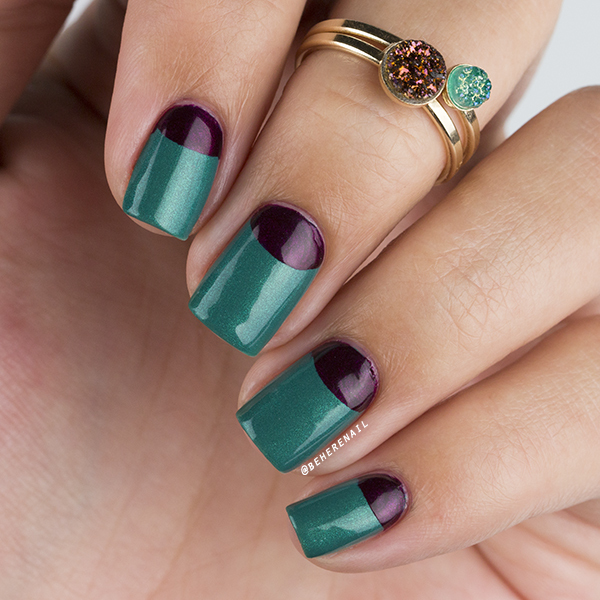 I did some simple half moons using Uncorked and Green with Wrennvy to show off the harmony of the polish and jewelry. 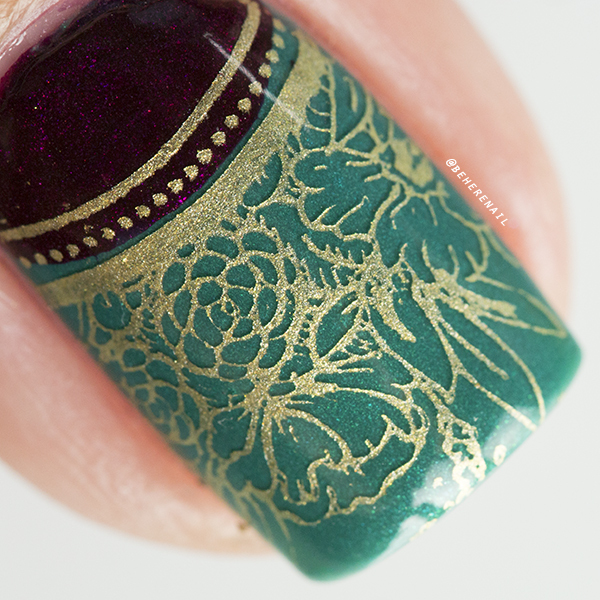 As usual I couldn't leave well enough alone, so here is some stamping over it using Hit the Bottle Spun Gold and the ÜberChic Beauty Paris mini plate. I thought the gold warmed everything up nicely! For Passionfruit Pink I wanted to bring out the gold shimmer while keeping the design subtle and neutral like the shade itself. 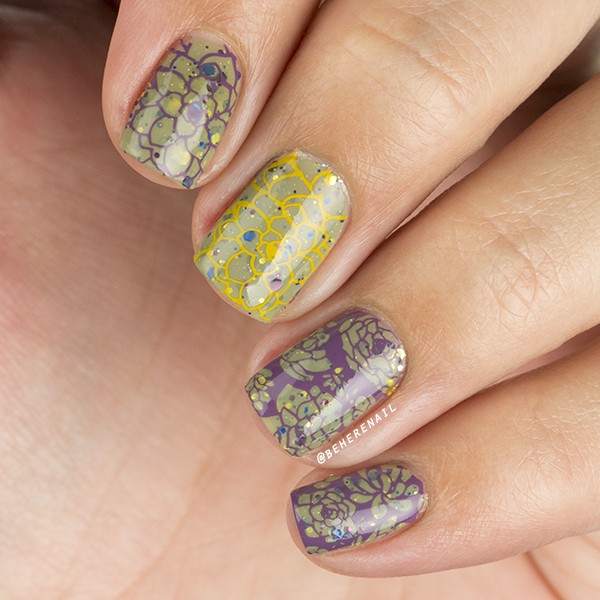 I used Hit the Bottle Spun Gold with ÜberChic Beauty Collection 2. 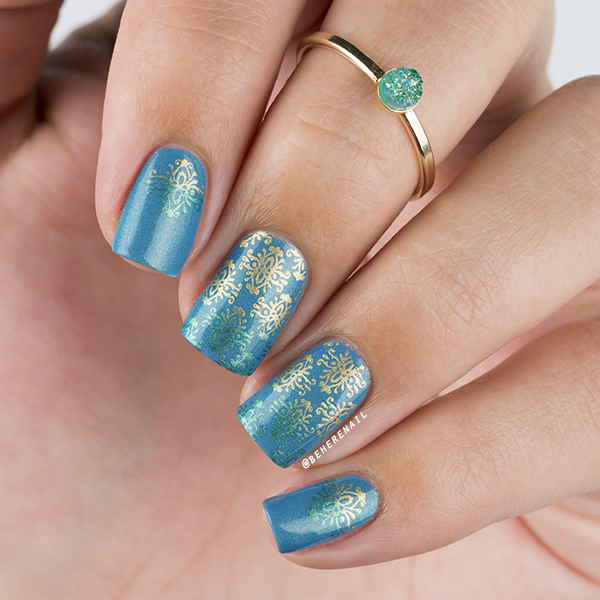 With A Pirate's Life I wanted to highlight the gorgeous aqua shimmer so I used Hit the Bottle I Wish I was a Mermaid and tied it in with the Alexa Tiny Ring by doing a stamped gradient with Spun Gold. Can you tell I had an absolute blast with these polishes?! I can't say enough what a joy everything was to use and wear! If you would understandably like any of these beauties for yourself, don't waste any time heading over to @shopwrenn on Instagram or www.shopwrenn.com. 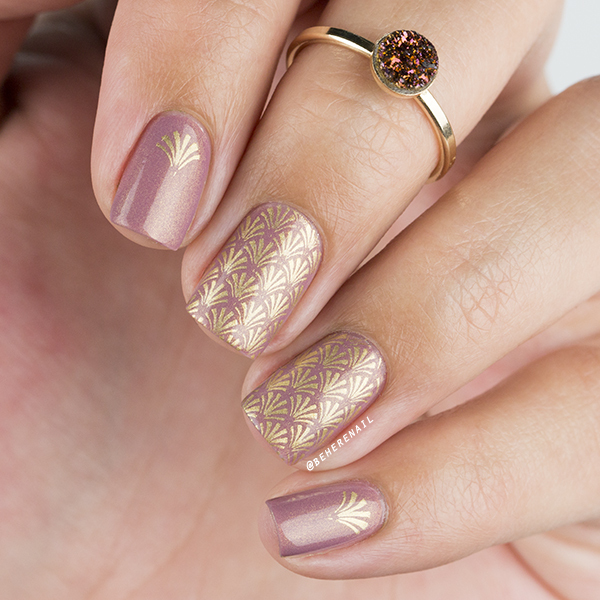 I love using negative space images to show off complex polishes and I recently got some great ones on ÜberChic Beauty's new mini plates. It's one of their biggest selling points for me as far as their plates go, they always make sure to include some excellent negative space images. I also recently got two fantastic glitter crellies by KBShimmer from an indie polish swap on IG, #bitchesloveindiesswap, and you know how much fun I have been having with the skittlette, so I decided to combine all three to do a couple of cute manis! Check them out below. First we have three coats of Smoke Signal. A light grey crelly with silver, red, orange, and turquoise holo hex glitters. Yeah it's a mouthful, but look at it! It applied like a dream. No gooping like a lot of other glitter crellies. The shade reminded me of Native American jewelry with sterling silver, turquoise, coral and spiny oyster shell, so I added some feather stamping done in Mundo de Uñas Charcoal with images from the new ÜberChic mini Fabulous Feathers plate that I thought also fit the jewelry theme. 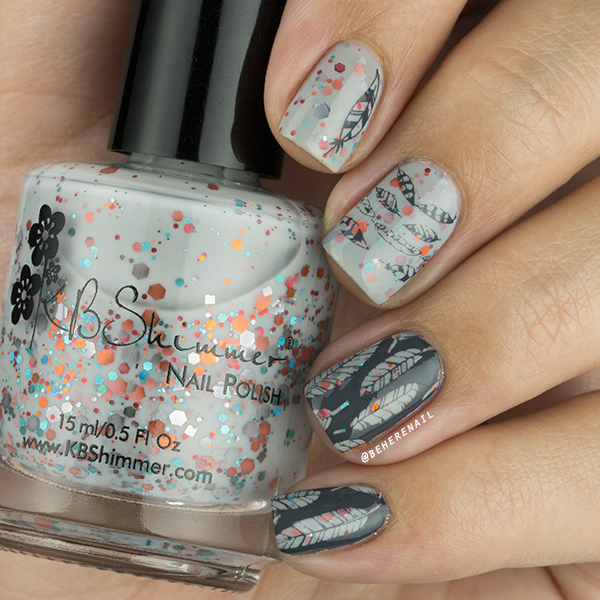 I love how negative space images allow you create a skittlette with only one base polish! 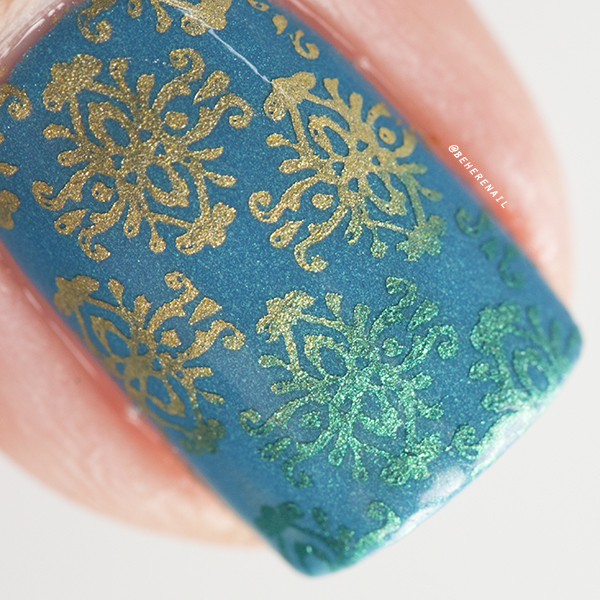 The next KBShimmer I received in my swap box was Open Toad Shoes. I only needed two coats of this funky shade. 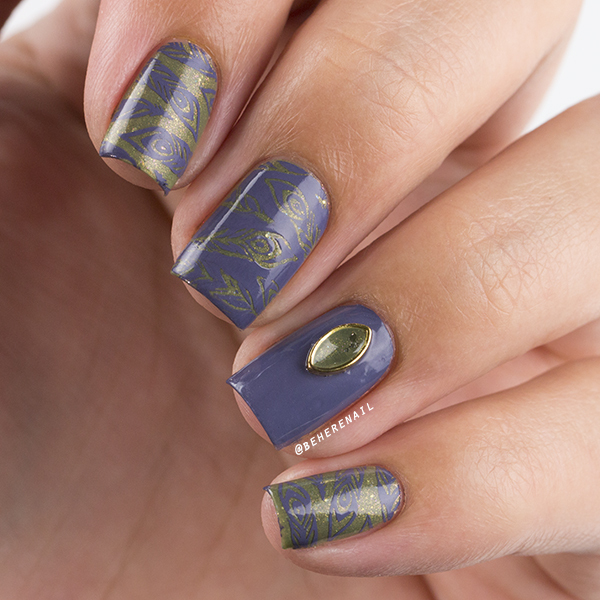 It's a light olive crelly with blue, yellow and eggplant hex glitters. This just screamed out succulents to me. You know my tendencies toward Southwest inspired manis! I had been dying to use the negative space image from the ÜberChic mini Succulents plate too, so I came up with this look using Mundo de Uñas Holly and Mustard. 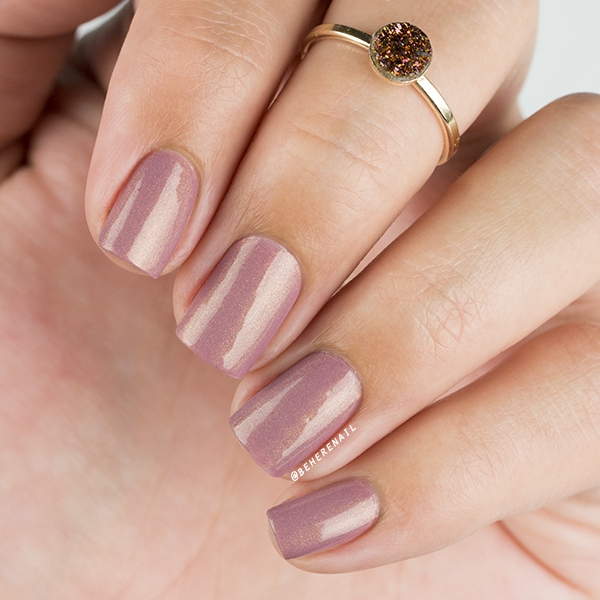 Again you have that perfect Skittlette look with only one base polish. I am so in love with it. I have to say how much I loved trying out these new KBShimmer polishes, they are definitely up there with my favorites. I can't wait to add a few more to my rapidly growing indie collection! Thanks to my #bitchesloveindiesswap girl Taryn for getting inside my head and picking what I wanted most!